The widespread adoption of cloud computing continues to increase the speed and efficiency of doing business. However, it also presents IT teams with a new set of security challenges, and a dizzying array of different platforms to monitor and secure from advanced threats. In this whitepaper, we'll tackle these probems. 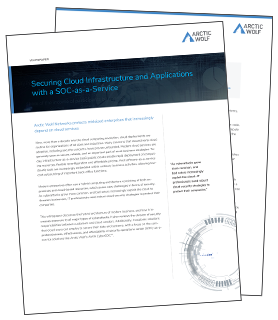 For organizations seeking a security operations center, Arctic Wolf’s AWN CyberSOC™ is the perfect solution. To do the equivalent internally would have cost us far more and taken many tmonths. AWN’s Concierge Security Engineer™ acts as extension of our IT team and provides a level of service that can only be described as incredible. © 2018 Arctic Wolf Networks Inc. All Rights Reserved.